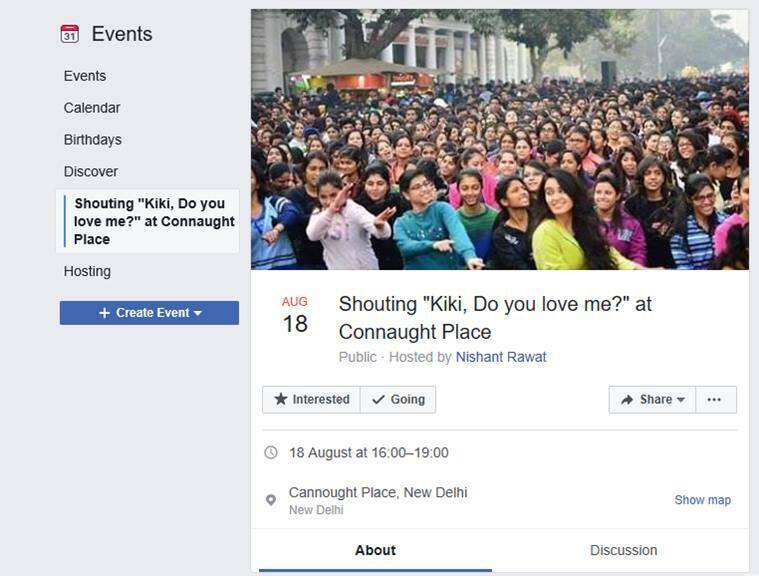 A Facebook event was created inviting people of Delhi to shout, "Kiki, do you love me" and over 3000 marked they are interested to attend it. We got in touch with the creator Nishant Rawat to find out more. Over 500 people have said are going to this event to be hosted in Delhi’s Connaught Place. Nishant Rawat, 19, created the event page last week and it already has over 3000 people who are interested to attend it while over 500 have marked “going”, at the time of writing. Indianexpress.com got in touch with the young DJ to know more about his quirky plan. Last year, thousands of Mumbaikars gathered together to shout “Bolna Aunty Aau Kya” on top of their voices in Marine drive and it seems Delhi might be gearing up for something similar. “I have seen it trend online and so I was curious to see if an event can be created by a general profile spread,” said Rawat who is overwhelmed by how quickly it went viral adding he did not expect such a response. “I know these videos are in trend so we will make the biggest Kiki dance challenge video,” he said adding no one has done a mass challenge yet. What started as a fluke, has turned into a buzz and now it seems Rawat might be up for a challenge himself. Organising any mass gathering is not easy and certainly not without police permission. “I am getting a lot of texts of people asking me if it’s really happening. I am already in touch with few event management companies to see how to work this out,” he added. He will let everyone know the exact venue and time if he manages to secure all permission. If he manages to get permission he will inform interested people about the exact place where he can host the event. Drake’s latest track from his June 2018 album Scorpion is a groovy number which first had comedian Shiggy dancing to the song on the streets. He uploaded the video on YouTube, calling it ‘Doing the Shiggy’ with hashtags #InMyFeelingschallenge and #Kekechallenge, which then took a life of its own as it went absolutely viral on Instagram. After Shiggy’s video, everyone tried their own version of the challenge which included teenagers, celebrities as well as middle aged people as a way to show off their moves. While Will Smith took it to another level by climbing it on a bridge in Budapest, many were filmed doing it in groups on terraces and parking lots. However, this took a risky turn when some began attempting dangerous ways to push the trend further. Many have even injured themselves by jumping out of a moving vehicle, so much that police had to intervene to warn people that it’s not cool. A few enthusiast even lost their lives in the deadly trend and with more and more celebrities trying the challenge, it doesn’t seem the trend is going to die anytime soon. Apart from Hollywood celebrities, even Indian actors have participated in the latest trend. 2 Homeless man in Silicon Valley hands out resumes at traffic signal; viral post gets him 200 job offers!